Jesus in the Temple is our Bible story for our January rotation. Our first-fifth grade kids are loving the PowerXpress units! The art station includes information on making a more traditional blue and white prayer shawl. Because our church has a knitted prayer shawl ministry, I hoped to connect the children’s project with our existing prayer shawl ministry. 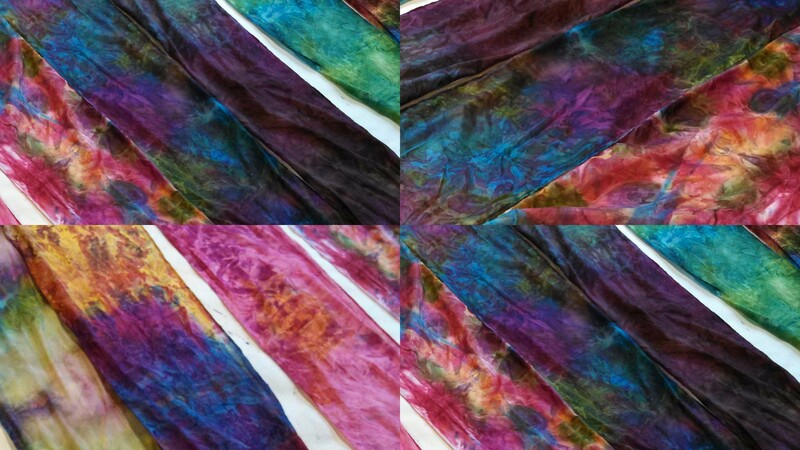 Time is short and I can’t knit, so after some research, I decided to do dyed silk shawls with the kids. Bless my hands as I create this shawl; Help me choose colors that show your love and care. Let this be a shawl that brings comfort to whoever receives it. Next week, our pastor will bless the finished shawls during our worship service. 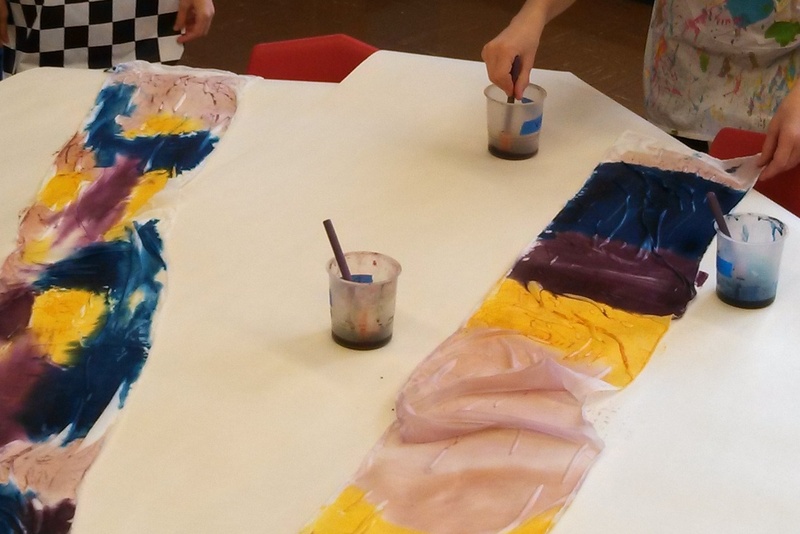 After a lot of consideration, I chose to use Rit Liquid Fabric dye because I felt the kids would enjoy painting the scarves rather than putting them in a pot of dye. The colors I chose were violet, wine, apple green, blue, yellow and taupe. I warned the parents in advance that we would be doing a messy project (note to self: it is time to investigate Sunday School t-shirts for the kids!). I brought in an old microwave from home to set the dye. Introduce prayer shawls and simple color symbolism to the kids. You can find a list of color meanings here. If you are using permanent dye, have the teachers move the dyes and scarves to and from the tables to avoid any colorful, messy accidents. Say the prayer of blessing. Have the children wet their scarves. This allows the colors to blend more freely together. Have each child choose 3-4 colors per shawl and apply with a foam brush More tends to muddy the colors too much. We found that painting 6 inch diameter color splotches allowed the colors to blend well. 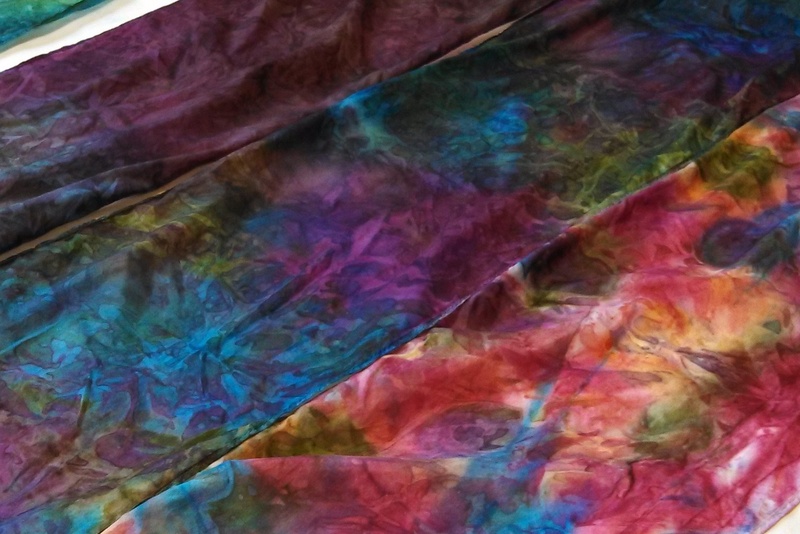 When the shawl is covered in dye, the teacher places each scarf in a seal-able plastic baggie. Microwave each scarf for 2 minutes total, 15-30 seconds at a time, watching to make sure they don’t catch fire. They will be hot, so be careful. Teachers rinse the fabric in cold water until it runs clear (you may want to use gloves to avoid staining your hands). Hang the shawl to dry. They never end up the same way twice, which adds to their unique beauty! I was amazed at the diversity of the finished shawls. The kids were excited to make them and can’t wait to receive them next week. I have already been asked if I can lead an adult workshop, too! I pray that these heartfelt creations will be a reminder of God’s love and comfort to each recipient.